The new Angela’s Kitchen shows off suave Afghan fusion dishes in an Alameda shopping plaza. Bert Johnson Maria and Saboor Zafari serve Afghan dishes with a distinctive, slightly Westernized stamp. Hours: Sun.–Thu. 5–9:30 p.m., Fri.–Sat. 5–10 p.m.
Angela's Kitchen, a Mediterranean restaurant that opened three months ago in Alameda's bustling Park Street corridor, has the feel of the kind of eatery I can imagine finding in a suburban New Jersey strip mall — a classed-up Italian-American red-sauce joint, perhaps, or a little New American bistro. The restaurant is, in fact, located in a kind of shopping plaza, next door to a Smashburger and across the parking lot from the Alameda Marketplace's assorted food shops. It's the kind of place where Sinatra (or some Sinatra analog) plays on the speakers, and where your waiter is the kind of incorrigible ham for whom that joke about how you must really hate the food to have cleaned your plate so thoroughly is never not worth repeating. If you've spent enough time in the small towns of America, you know the kind of place. The fact that there isn't a single trendy thing about Angela's is part of its charm. The other, more significant part is the food: Afghan flavors filtered through the lens of old-school French cooking techniques and other Western influences. And just like those rare strip-mall discoveries I'd scout out in the Jersey suburbs where I grew up, Angela's Kitchen serves food that is tastier and more ambitious than just about anything else you'll find in its immediate vicinity. Pound for pound, it might just be the best restaurant in Alameda. Chef-owner Saboor Zafari, a native Afghan, came to the United States in 1977 to visit his brother, a college student in Madison, Wisconsin. Within months of his arrival, the pro-Soviet faction in Afghanistan had staged a military coup. Over the next ten years and beyond, everything in Zafari's homeland went to hell. "The rest is history," he said. "I've never been back." 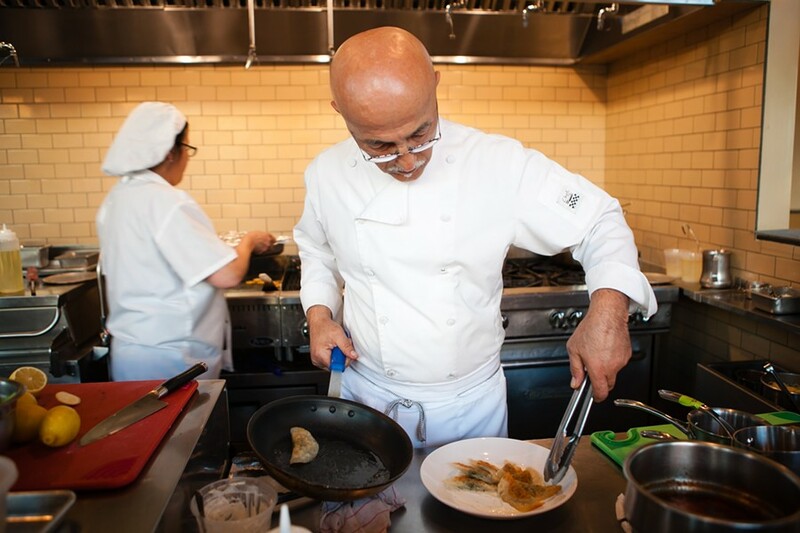 In Wisconsin, Zafari taught himself to cook, with help from the classically trained chef at the French restaurant that he and his brother bought in the early Eighties. This was where Zafari was schooled in the nuances of how to make a proper beurre blanc, and where the seeds of the first Angela's — which Zafari opened in 2001 in a strip mall on the other side of Alameda — were planted. 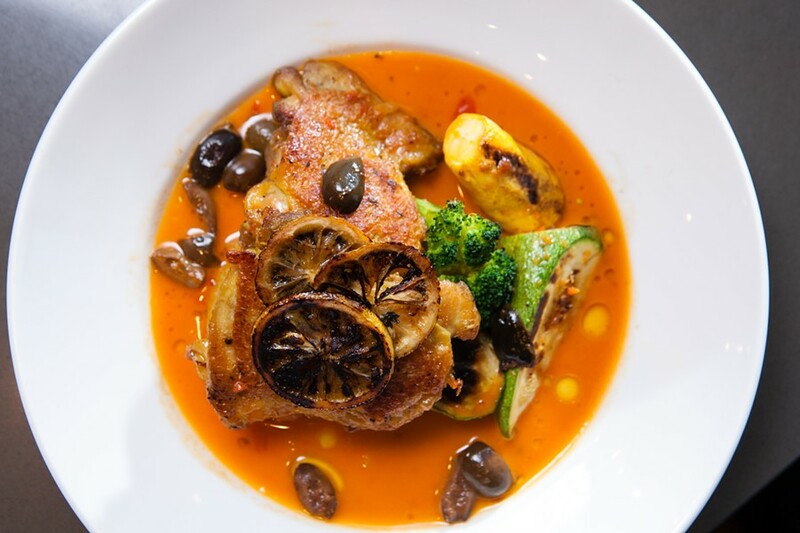 Named after his daughter, Angela's took the Afghan spice palette of saffron, coriander, and dried mint and applied it to Zafari's favorite French and Italian dishes. The current Angela's is actually the fourth incarnation of the restaurant. Zafari said the second, Angela's Bistro, was an investor-driven project that served more generic Mediterranean food until it closed in 2013. In September 2014, just weeks before Zafari was set to open a new Angela's on Park Street, the restaurant was gutted by fire. Angela's Kitchen opened a year later almost directly across the street from the fire-ravaged site — a testament, Zafari said, to an outpouring of community support after it turned out that he didn't have fire insurance. The kebab at Angela's Kitchen. 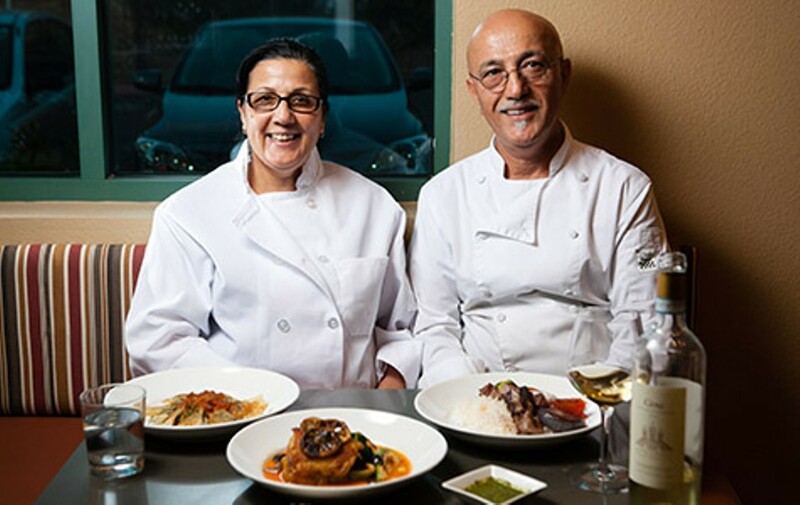 For Zafari, Angela's Kitchen is something of a return to his roots. It's a family-oriented affair: His wife, Maria, is also a chef at the restaurant. (She does most of the baked goods and will run lunch service when it kicks off in the next month or two.) And compared to his earlier restaurants, Zafari said, the new Angela's is probably the most Afghan in its focus — with kabobs and other mostly traditional dishes occupying at least as much menu space as more obviously fusion-y dishes such as pasta and risotto. Still, it was clear from the very start of the meal, when our server brought out a basket of warm, olive-oil-tinged bread that was halfway between a focaccia and a dense Afghan flatbread — with a bright walnut-mint pesto for dipping — that this was no traditional Afghan restaurant. Presentation tended more toward fine-dining than rustic, and in many of the dishes, it was Zafari's background in French cooking that shined through. This is the kind of old-school French cuisine that leans heavily on rich, buttery wine reductions — a throwback to a style that was trendier in the Nineties and early Aughts. Take the duck strudel appetizer, which, in many ways, is Zafari's signature dish. The chef said he invented the dish back in his Wisconsin days as a way to use up some duck legs he had in the freezer and a cranberry wine that no one was ordering. The resulting dish is a stunner: crisp phyllo dough wrapped around duck confit, wild rice, and sautéed mushrooms. The meaty little pastry is served in a cranberry wine reduction that's made with duck stock, caramelized shallots, and cream — a not-too-sweet, intensely caramel-y sauce that evoked everything good about Thanksgiving dinner, and was so heady and aromatic, I swore it perfumed not just the dining room but also the parking lot outside. Even the dishes that hewed pretty closely to traditional Afghan recipes had a distinctive, slightly Westernized stamp. My favorite of these was Zafari's take on aushak, a kind of Afghan leek-and-spinach ravioli that's traditionally served steamed. 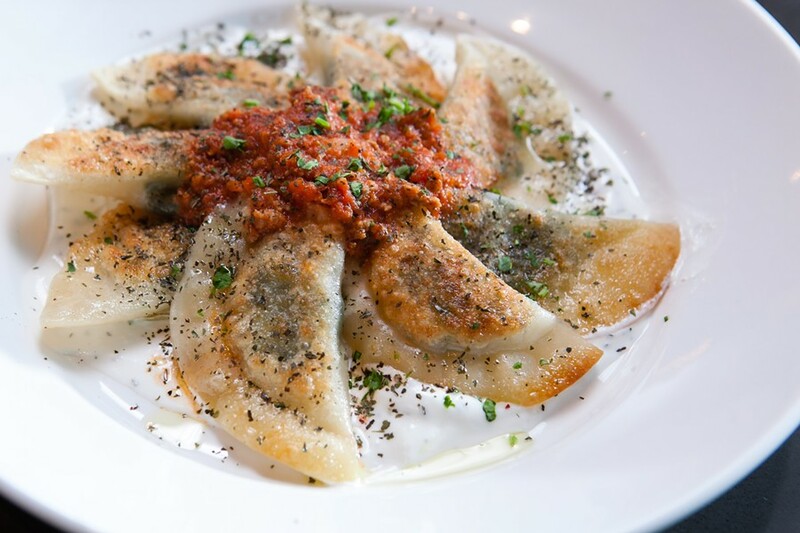 At Angela's, these were pan-fried as though they were pierogies, adding an element of caramelized crispness that made this a more decadent entrée — and went beautifully with the accompanying layer of yogurt underneath and the tomato-based meat sauce on top. The borani was a fairly straightforward version of another Afghan classic, borani banjan: thick slices of grilled eggplant, topped with a savory tomato sauce and dried mint and, again, served over yogurt. At Angela's, though, the cross-cultural connections seem to be everywhere: Close your eyes, and it's not hard to imagine that you're eating a not-so-distant cousin of eggplant parmigiana. Other dishes were more broadly "Mediterranean." A shrimp risotto special featured creamy, al dente rice that was a bit too oatmeal-like in its texture, but also impeccably grilled shrimp that were tinged with a well-spiced slick of red oil — the one Afghan touch. Meanwhile, I read "Moroccan lemon chicken" on the menu and mistakenly conjured up an image of a rotisserie chicken that you'd find at certain Middle Eastern restaurants, served over a heap of fragrant rice. Instead, this was more akin to a tagine: tender thigh meat served in its own tomato-infused braising liquid. The warm bread pudding we had for dessert was soaked in a sweet whiskey reduction — very good, but Afghan only in the choice of fruit to include (persimmon and pomegranate). 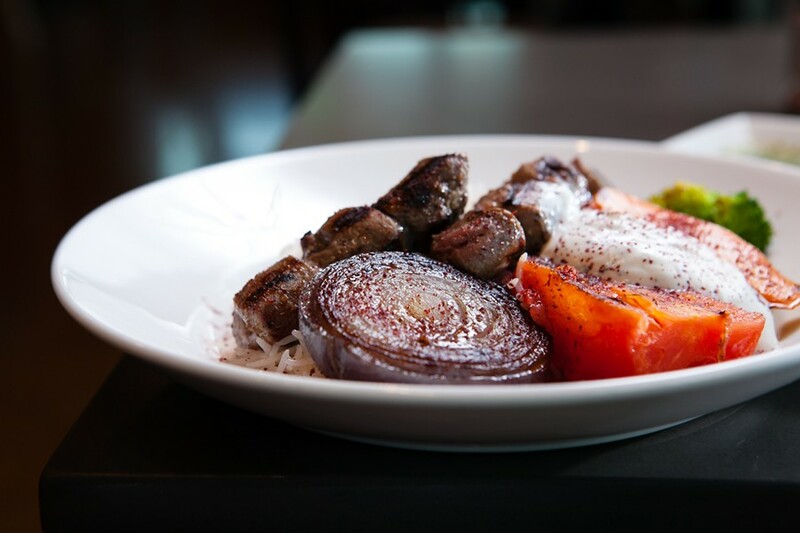 Perhaps the one dish that best embodied both the strengths and weaknesses of the restaurant's modern, Westernized approach to Afghan cuisine was the lamb kabob. On the one hand, the cubes of lamb tenderloin were well seasoned and — most strikingly — impossibly tender. But on the other, the meat was served with a bland version of pallow (the traditional Afghan rice dish) and, to add insult to injury, a side of even blander steamed broccoli and baby carrots — a stuck-in-the-Eighties vegetable offering that seemed designed to fill a health quotient rather than to add flavor. During my meals at Angela's, I didn't notice any customers of Middle Eastern descent, but I did see couples who were there to celebrate an anniversary and children dressed up for their birthday or from have just performed at a holiday concert — this being just the right kind of low-key, special occasion-worthy place to bring a kid who has an appreciation for good food. Like many restaurants in Alameda, the customer base seemed to skew toward young families and the elderly. Would such an audience embrace some bolder Afghan flavors? Seeing how much they've already taken to the place, I wouldn't be shocked if they did.